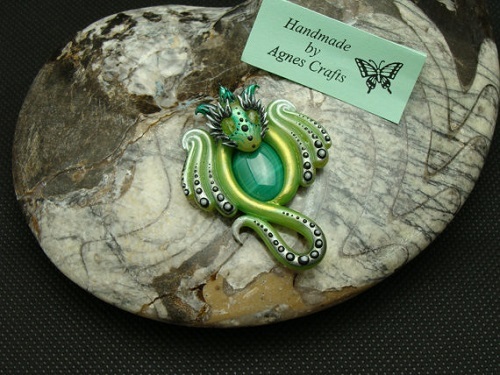 Agnes, a Polish but Wales based artisan is accomplished in many crafts - tatting, paper wicker art, cake making. But she says her most recent passion is polymer clay. Her shop, AgnesCraftsShop, shows off her clay skills. 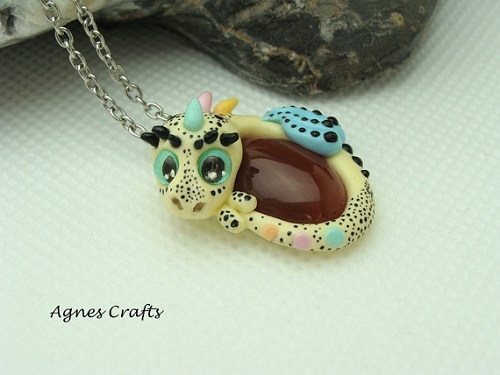 She specializes in polymer clay animal necklaces all of which include gemstone cabochons in the designs. Her attention to detail is evident. Her designs are colorful and the bodies of the animals are often embellished with raised or sunken dots. Really lovely metallic touches too. My favorites are her dragons and sea turtles which she makes in various sizes. See more of Agnes' work on her Instagram and Facebook. Thank you so much for sharing my art and a nice article. You're welcome. Thank you for inspiring all of us! Love how she uses the cabochons for the bodies! Divya says it!! Look at that baby dragon! An impressively mastered art! These are amazing! I love the use of the stones also. Those are so fun! Can't decide whether I prefer her dragons or turtles.